I'm sure I must have mentioned this before, but before the stroke I worked in IT. Well, immediately before the stroke I'd decided to have a career break and had followed my passion to become a bicycle mechanic, but, prior to that, I'd spent 25-odd years in IT, at quite a high level, amongst other things designing multimillion systems for banks. I worked at the high-net-worth end, with asset managers as clients. One of the clients was also Coutts. I decided quite early on in my career that I wanted to stay as technical as I could, rather than becoming managerial, although in later years there was lots of cross-pollination. Ironically, I had already decided to go back into IT by the time of the stroke - bicycle mechanics live on minimum wage. Then the stroke happened which was, to put it mildly, a setback. Anyway for the last year and a bit I have had a goal of returning back to work. Everything is a bit slower one-handed (i.e. one-fingered!) and I make plenty of misspellings. Fortunately I correct most of them before they ever get published, plus with the tools I use, something called a compiler will insist that I type things properly. But whilst I felt I'd had enough of IT back in 2013, I've regained a lot of the passion I used to have in those early years. Plus I'm more experienced in a great many ways, and I make better decisions. But time marches on, and I needed to resharpen my IT skills back to full speed. So I've been doing little projects, just aimed at getting myself back up to speed with things. Little web sites, spreadsheet macros, writing my own applications. I mean, I used to run my own business so I was used to thinking at an entrepreneurial level, and there are plenty of ideas. Plus, as I've said I performed a niche job at a niche level. The current project - I started it getting on for 6 months ago, with just me working on it, albeit part-time alongside other commitments - is a Diabetes Tracking application. As you'll know from past posts, diabetes is significant for me. It is funny, working on these things, how most of the time life just rolls along, the functionality of the application just increases at a pretty-much constant rate - that comes with the familiarity of a particular technology, and the experience of knowing where and how to find information when needed. I used to find the same with my big clients. But every now and again, something tiny comes along which really throws a spanner into the works. One of the perks of doing my own stuff is that I don't have any formal deadlines, unlike when I consulted for other people. So I can prioritise "properly" over "quickly". One such area was the usability of a small part of the application. It might be small but it was critical - it is how someone would enter one of their glucometer readings. 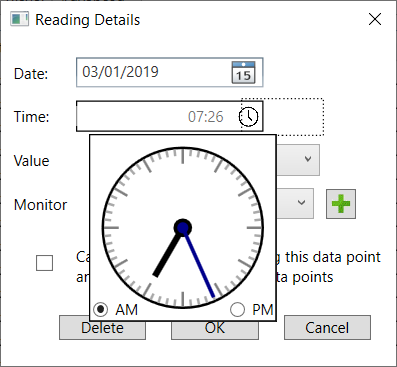 The control to capture the timestamp of a reading - its date and time - just wasn't usable. So, I took the wheels off, and set about re-working the screen. The "date" aspect was no problem, as there was something perfectly good that I could use out-of-the-box. But the "time"...well, I've probably spent most of the last fortnight trying to find something that looks good and is usable. I must have evaluated many people's efforts at a TimePicker, to see if I could either use it or extend it so I could use it. (Sorry, the screen capture program in Windows has cropped the lowest part of the image.) 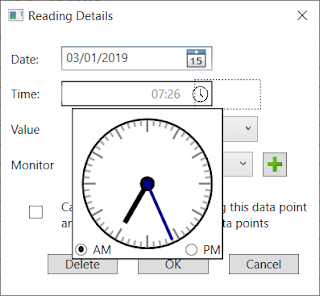 But I quite liked the idea first of some kind of pop up clock, which appears and disappears as the user works with it, and secondly of an analogue clock face. In terms of usability, the user just drags the hours and minute hands around the face, so pretty easy. The control is extended from somebody else's work - if I'd have done it from scratch, it would have been two lists, one 0-23 hours, and the other 0-59 minutes. Two weeks' effort. Was it worth it? You can see some more screenshots of my application, its pre-release name is DIEM, at http://www.diemware.com. For now it runs on Windows, just because that's where my expertise lies. But already I'm thinking of tablet versions to run on Apple or Android (maybe next version!) One of my thoughts with the project is that I want to try and help people rather than try to make money out of them, so when it is complete I want to distribute it for free. But to that end, one of my own drivers is that I don't want to be spending megabucks myself to buy suites of fancy controls, when I don't really hope to gain any revenue from it. So lots of my decisions have been based around the cost implications of using a particular approach.